This pet is only purchasable from Nat Pagle at a level 3 Fishing Shack. Players must have the Good Friends reputation with Nat Pagle in order to buy the Sea Calf. The Fishing Shack can be built and unlocked at level 94. Upgrading it to level 3 requires the achievement "Draenor Angler" and a level 3 garrison. To earn Nat's Lucky Coin (and reputation with Pagle), players will need to fish for special fish called Lunkers. Turning these in will reward friendship with Nat Pagle as well as one coin each turn in. Read more about catching Lunkers in El's Extreme Anglin' guide. Finally got this pet today. Just fished up and down the east coast of Spires of Arak to get the 50 lunkers. Took some advice from the Wowhead comments, and focused on pools vs. open sea fishing. With a Tentacled Hat + Ephemeral Fishing Pole + Worm Supreme + Fishing enchant to gloves, had 1105 fishing. Averaged about a 7% fish rate on the lunkers. I agree with last comment, it is too small! 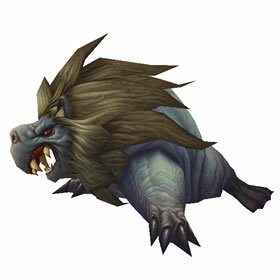 What is with blizzard ruining otherwise cute pets by making them soooo teeny tiny? I really don't like that, it is pretty disappointing. Anyone know if you can visit a garrison with Nat Pagle and have the option to interact with him to buy the pet? The Sea Calf initailly showed up for sale from Nat Pagle but has since disappeared from his available items. I'm submitting this as a bug to the WoW devs. Working on fishing more lunkers to purchase extras - will post how many will be available for trade soon. Same problem here. Dont know if its a bug or if it need to be unlocked . . . The notes here say that it sold by Nat Pagle in the garrison, but it's not currently for sale. I've unlocked the level 3 fishing shack and can buy everything else he's supposed to sell (drinking hat, draenic fishing pole, land shark pet, fishing journal, crimson water strider mount), but this isn't showing up. Wowhead doesn't list how to obtain it either. The sea calf has a natural affinity for balancing things.